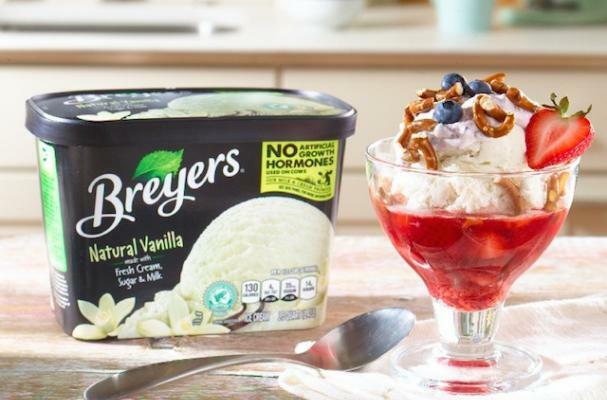 Celebrity chef Antonia Lofaso has partnered with Breyers ice cream to create tasty recipes using the ice cream. This easy stars and stripes sundae is one such creation. A festive dessert for Independence Day, vanilla ice cream is topped with a homemade strawberry sauce, fresh blueberries and light and airy whipped cream. Salty pretzels add crunch and a contrast to the sweetness of the sundae. This DIY dessert will leave you stress free this holiday weekend. Step 1: For the whipped cream, either by hand or with a stand mixer fitted with a whisk attachment, whisk cream, crushed blueberries and powdered sugar until soft peaks have formed, about 5 minutes by hand and about 3 minutes with stand mixer. Step 2: In an 8-inch sautée pan, combine water and sugar with strawberries and cook on medium to high heat for about 5-6 minutes until water and sugar creates a syrup and strawberries begin to slightly breakdown. Step 1: To make each sundae, spoon the warm sautéed strawberries into the bottom of a small bowl. Step 2: Top with 2 scoops (1/4 cup each scoop) of Breyers Natural Vanilla Ice Cream. Step 3: Add a small dollop of blueberry whip cream and sprinkle with the pretzels. Nutrition tip: Looking to save some calories? Skip the whipped cream and just add the fresh blueberries on top!